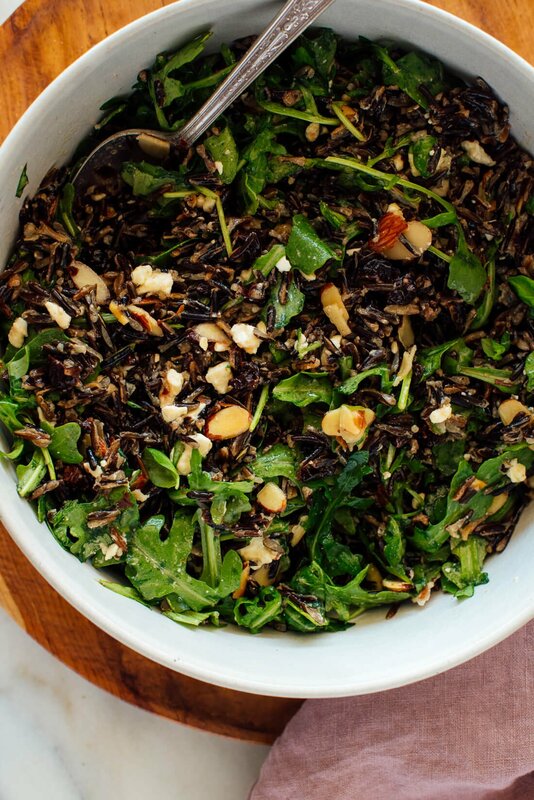 Have you tried wild rice in your salads yet? I’m hooked! 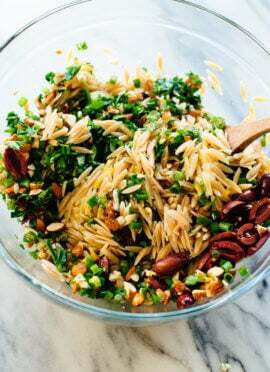 Wild rice is chewy, nutty, and hearty. It’s high in protein and B vitamins, and adds a strong backbone to healthy green salads. 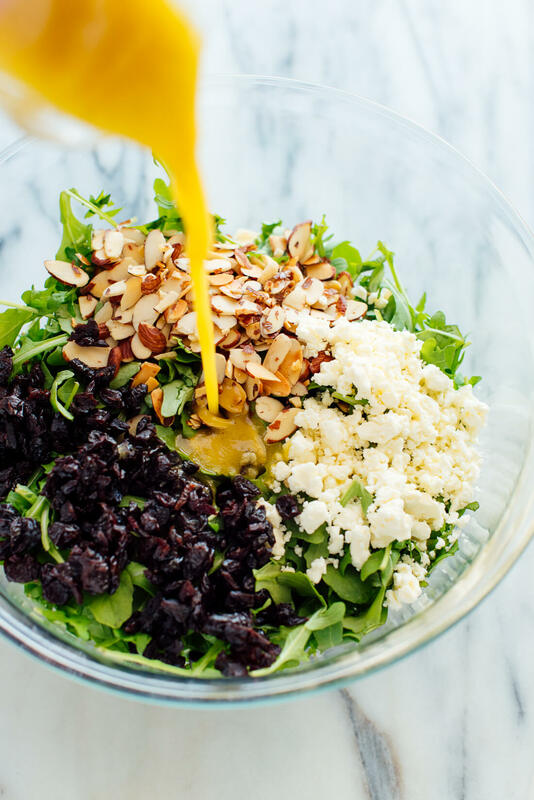 This salad is wholesome and filling, with plenty of bold arugula and bursts of flavor in the form of toasted almonds, creamy feta, dried tart cherries and fresh basil. I shared this recipe several years ago, but I’m afraid the photos weren’t doing it justice. This salad should be a strong contender for your Thanksgiving table. It could pull double-duty as a hearty vegetarian option and serve as wild rice stuffing. It’s also a great healthy weekday option as the holidays approach (leftovers pack well for lunch). If you aren’t quite sold on the concept yet, I have a little story for you. My boyfriend usually claims that arugula is too “peppery” for his liking, and initially declined the salad. Then, he got a look at it and asked for a bite. Then, I heard, “This salad is really nice.” After a few more bites, “Why is this so good? What’s in it?” Finally, “This is so good. Will you make this for me on my birthday?” Victory!!! 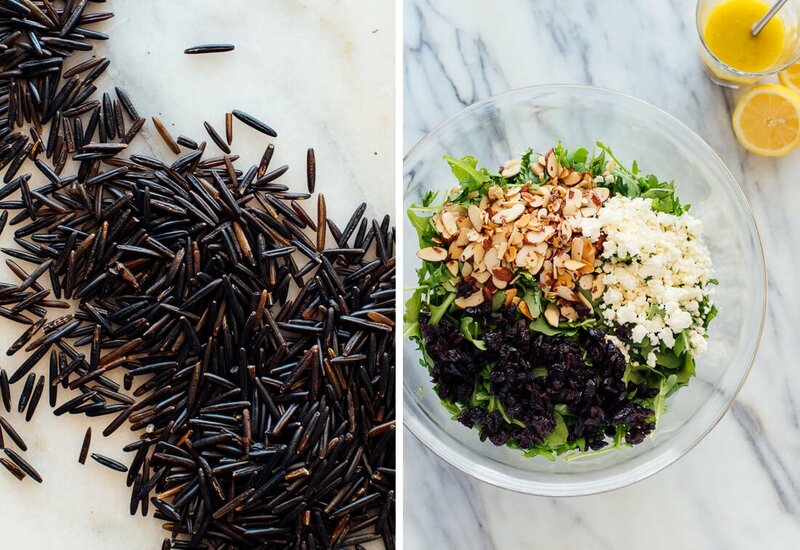 To make this salad in advance: You’ll want to cook the wild rice beforehand, at minimum. You could also whisk together the dressing, and compose the salad (don’t toss it with the dressing until you’re ready to serve). Store any components in the fridge, covered, for up to two days. 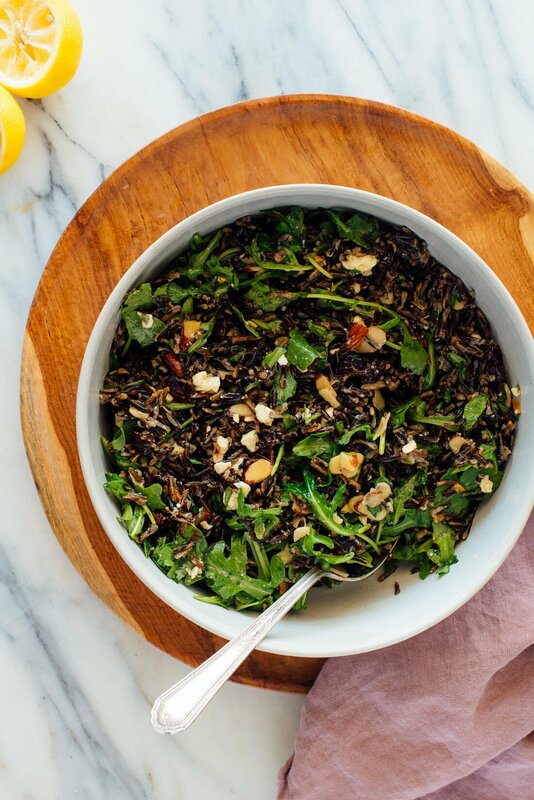 You can cook the wild rice in your Instant Pot, if you have one. It turns out great, and it’s nice not to babysit the pot while it’s cooking. 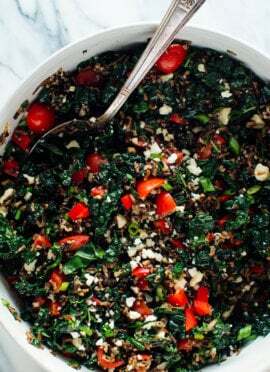 See the recipe notes for details (I learned how to cook wild rice this way when I made this wild rice salad, from Megan’s The Fresh & Healthy Instant Pot Cookbook. 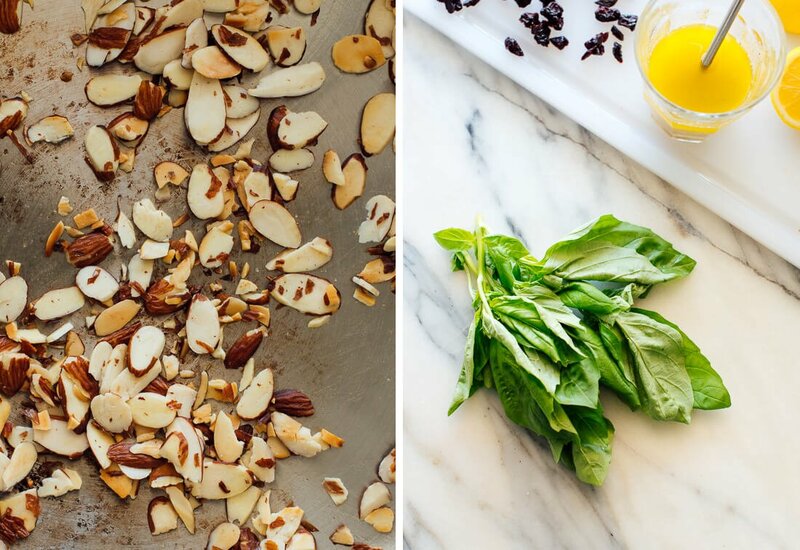 Don’t skip the toasted almonds step. Toasting the almonds brings a lot of irresistible savory flavor to this salad! The almonds can burn quickly, so don’t step away from the stove while they’re cooking. Crumble the feta by hand. I always recommend crumbling your feta (or goat cheese) with a fork before using, rather than buying the pre-crumbled kind. Pre-crumbled is coated in powder to prevent clumping, and it doesn’t taste nearly as good (it’s also more expensive per ounce). The only exception to this rule that I’ve found so far is the crumbled feta by Organic Valley. You can easily double the recipe for a larger crowd. As written, it yields 4 medium hearty salads, or could be stretched to up to 8 side servings. The arugula wilts down quite a bit (which is nice), but the wilting effect does make the salad look less substantial than it really is. Please let me know how this salad turns out for you in the comments! I’m always so eager for your feedback. 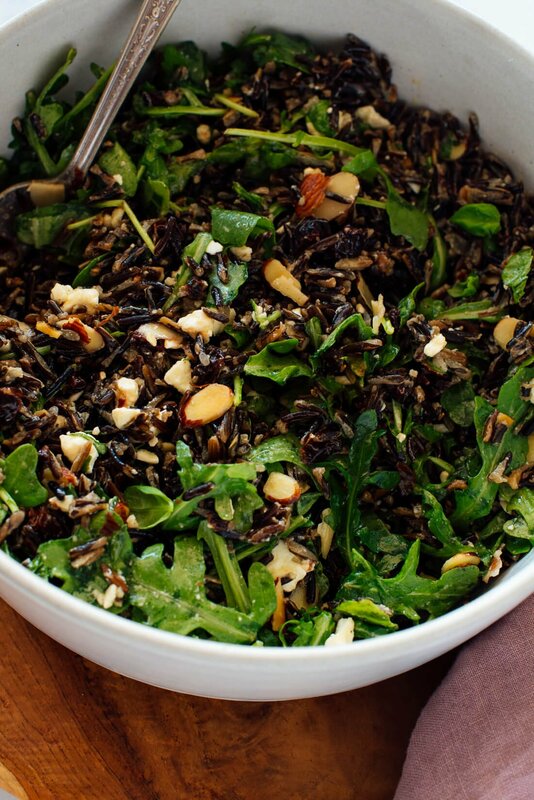 This wild rice salad includes arugula, dried cherries, toasted almonds and feta, tossed in a zippy lemon dressing! It’s gluten free, filling and delicious. Recipe yields 4 medium salads, or 8 small side servings. To cook the wild rice, bring a large pot of water to boil. Add the rinsed rice and continue boiling, reducing heat as necessary to prevent overflow, for 40 minutes to 55 minutes, until the rice is pleasantly tender but still offers a light resistance to the bite. Remove from heat, drain the rice and return the rice to pot. Cover and let the rice rest for 10 minutes, then remove the lid and let the rice cool. To toast the almonds, warm one teaspoon olive oil in a small skillet over medium-low heat. Add the almonds and a pinch of salt and cook until they’re turning lightly golden and fragrant, about 4 to 5 minutes, stirring frequently. Set aside to cool. In a small bowl, whisk together the dressing ingredients until blended. 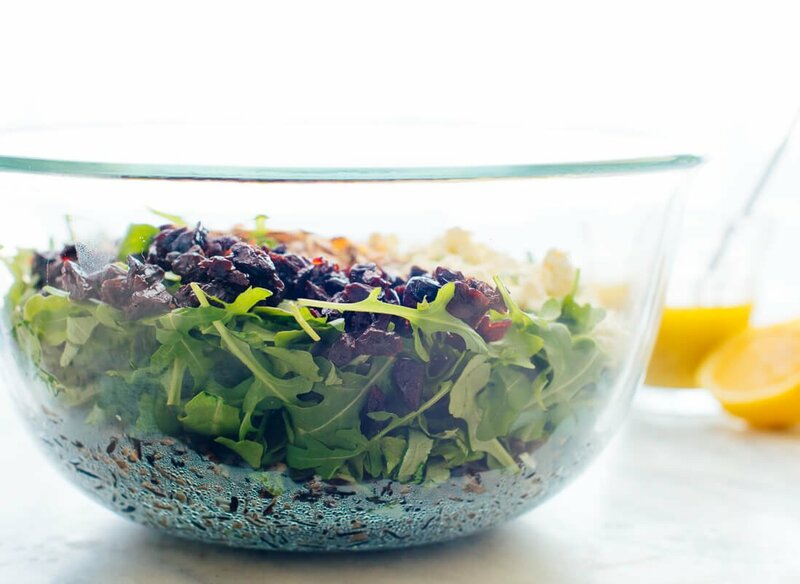 To assemble the salad, transfer the cooled rice to a large bowl. Add the arugula, chopped basil, almonds, sour cherries and feta. Pour in the dressing, toss well, and season to taste with additional salt (I usually add another pinch or two) and pepper. If the salad needs more fresh, bright flavor, add up to 1 tablespoon more lemon juice. Set the salad aside for 10 minutes before serving, to give the rice time to soak up some of the dressing. This salad keeps well in the refrigerator, covered, for two to three days. You might need to wake up leftovers with an extra drizzle of olive oil and squeeze of lemon (the rice absorbs the dressing over time). Recipe inspired by Plenty More and my trip to Michigan to learn about tart cherries. Make it vegan: Skip the feta cheese and substitute maple syrup for the honey. Make it nut free: Substitute pepitas for the pecans. Instant pot option: Add the wild rice and 1 ¼ cups water to the Instant Pot. Secure the lid and move the steam release valve to Sealing. Select the Manual/Pressure Cook option and cook on high pressure for 22 minutes. When the cooking cycle is complete, let the pressure naturally release for 10 minutes, then move the steam release valve to Venting to release any remaining pressure. When the floating valve drops, remove the lid and give the rice a stir. Let the rice cool for at least 10 minutes before tossing with the remaining ingredients. 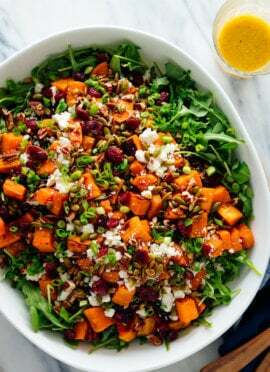 Change it up: You can change up the whole grains (farro would be my top pick), almonds (pecans or pepitas would be lovely), feta (goat cheese would work just as well), and dried cherries (simply use dried cranberries). If you can’t find fresh basil this time of year, you can safely omit it. Made for husband’s guy night, paired with steak. It was a huge hit! Very easy to make too…. (used instant pot for rice portion- much quicker). Guy night plus a salad, I love it! Thanks for the review. I love this salad, it is so fresh and delicious. I have been using many of your recipes and they are all great. They are easy to follow, and I appreciate the tips you offer along the way and the pictures with the instructions. I purchased your book, Love Real Food, and have also used many of these recipes. The guacamole with pepitas has been a favorite with my family. Thanks! Thanks for purchasing my book, Susan! I’m glad you have been loving the recipes. Spinach instead of arugula, topped with arugula micro greens for some spiciness, I didn’t have goat cheese, so I used parmesan reggiano and aged cheddar and added avocado to get the creaminess goat cheese would have imparted, and instead of fresh basil I used a mix of herbs and wild greens from the yard, then sprinkled some dried basil into the dressing. You’re right – it holds up well in the fridge, and it was wonderful as leftovers the next day. I can’t wait to make it with the ingredients in the recipe! Thanks for sharing your variation, Kate! Thanks for your review.